Allergy issues are a serious matter in the food industry. Federal law says that food processing companies in every state and territory are responsible for protecting their foods from contamination that could cause allergy complications, as well as labelling their foods in a way that makes it easy to tell what kind of potential allergens may be present in a certain food. For a food manufacturing or processing company, cross-contamination of foods can lead to severe allergic reactions that can have devastating health repercussions for consumers. These situations can also cost your company money. In New South Wales, for example, the NSW Food Authority has the right to investigate breaches of food handling and processing guidelines, penalise offending organisations, and recall foods that come from businesses that fail to properly declare allergens on their labels. There are many actions that food companies must take if they wish to safeguard the food products that they work with from contamination. For example, your company must have thorough sanitation policies that address both employee practices and guidelines for cleaning equipment that is used for storing or processing foods. You also must be sure that your waste is managed properly so that it can’t accidentally contaminate the rest of your facility’s food products with allergens. One consideration that’s especially important for safeguarding your foods from contamination is the barrier equipment that your company uses. It’s critical that your plant or facility is set up with the proper types of doors and barriers so that you can keep your foods safe from contaminations that could cause allergic reactions. These barriers and doors help put a stop to several kinds of issues that can cause contamination leading to allergy problems. When certain kinds of raw foods are mixed it can cause serious allergic reactions that could lead to health problems or even death in extreme cases. Government research shows that some of the most common food allergies include fish, eggs, peanuts, and crustaceans. Companies that have multiple types of nuts in one area, for example, will need to keep them separate so that cross-contamination cannot occur. Barriers and doors play a key role in this separation. 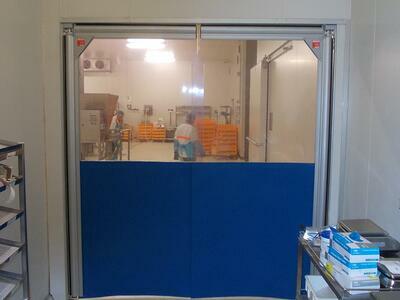 A PVC Stripdoor, for example, is flexible enough to allow movement easily, but strong enough to protect separate processing areas from cross-contamination through airborne particles that you might not have known about. Another valuable kind of barrier that can help you address cross-contamination issues is a dividing screen or partition. These barriers also protect food-processing equipment and raw materials from cross contamination, and they can help serve as dividers for different work zones for the various kinds of raw foods you work with. These dividers often also play a valuable role in letting your employees know about the separation of foods in your facility. The temperature of foods and food products that you work with must also be taken into consideration. If the temperature of these foods changes unexpectedly in your facility, they may become more susceptible to contamination that could cause illnesses or certain types of allergic reactions. The government mandates that foods like meats, dairy products, fruits, and vegetables all must be kept at specified temperatures so that they are safe to eat. Your barriers and doorways play a much more critical role in temperature control than you might think. When you need to store certain products at specific temperatures, opening doors can cause minor fluctuations in those temperatures that over time can pose a danger to your foods. If these doors were to be accidentally left open due to a malfunction, you might see large volumes of your production foods rendered unusable because of contamination due to temperature changes. One easy way to prevent this problem is through PVC Swingdoors. Top quality swinging doors will be designed with durable, resilient materials that resist changes in temperature. Whatever types of foods you work with, staying sensitive to possible contaminations of your products or equipment that could cause an allergic reaction should be a paramount concern. Not only could this contamination lead to severe legal repercussions from governing federal and state bodies, it might put some of your consumers in a very dangerous medical situation. According to the government of NSW, Australia has one of the highest allergy rates in the entire world. Allergy and Anaphylaxis Australia states that: "Australia has one of the highest reported incidences of food allergies in the world, and the numbers are growing at an alarming rate. In fact, one in 10 babies born in Australia today will develop a food allergy. An allergic reaction can quickly become life threatening and people can die from food allergy. While the risk cannot be removed, it can be managed. It’s up to all of us to be allergy aware – to know how to minimise the risk of a reaction, to know what to do if a reaction happens, and to understand and support family, friends and colleagues living with food allergies." By seeing that your equipment works properly and is chosen based on the standards for optimal safety and facility hygiene, your organisation can make sure that its products do not end up causing allergy issues or break any of the pertinent laws that your entire company is responsible for following. 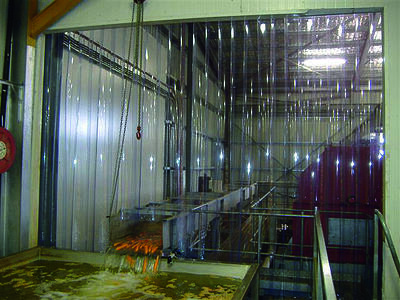 Find out how Mac's Shortbread created a partitioning system in their processing warehouse to separate the heated production line from an air conditioned line, click here.